it's almost midnight and i am tired but i can't sleep. every night i go to bed and i can't sleep. i wake up feeling like there is something i need to do, there is somewhere i need to be. but there isn't. it is 2 in the morning, it is 3 in the morning, it is 4 in the morning, and the only place i have to be at is in bed. is sleeping. is resting. i am doing my usual rounds of internet window shopping. maybe it calms me, i am not sure. half of it is me fully buying into the fashion aspirational complex – how much better would my life be if i wore this crazy wolf j.w. anderson velvet blouse? – and the other half is me making fun of the ridiculous. everything is compartmentalized. except now everything is literally compartmentalized. fashion loves a half. here's a mcq alexander mcqueen skirt, that's really just a a half a skirt. 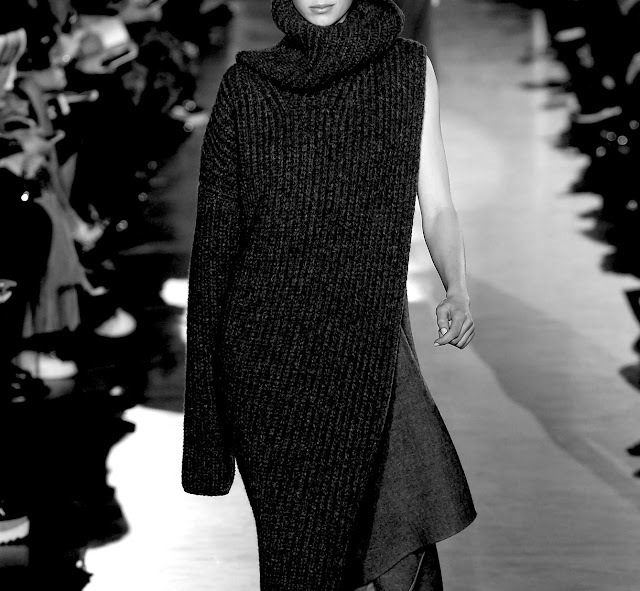 here's a stella mccartney sweater dress that is really just a half a dress. here's a delfina delettrez single earring. nothing will make us feel whole anymore, or at least it won't be as easy as it used to be. we have to work twice as hard for that full lewk. "all your dreams will come true, all my dreams came true, but now i have a bunch of other dreams"
for fashion to work it needs to deny accessibility. most people don't want what everyone has if they can easily get it, it has no meaning. fashion continues to fancy itself an elite thing, above all others, for the few, but it still wants to play with in the playground with all the other kids. saint laurent opens a couture line that's supposed to be more exclusive than couture *eye roll* but casts a cool young musician to be in the ad campaigns. fashion turned its nose on kim and kanye and the kardashians and reality tv until it realized that none of them actually needed fashion to succeed. now they have kendall, their very own doll, attached enough to the kardashian universe but without all the icky backstory, and yeah ok, racial history, that kimye have. it's a perfect match and everyone wins. half of this and half of that. "you can look but you can't touch, i don't think i like you much." so now that things feel like they are getting too close, like they are slumming it too much with the rest of us and are beginning to enjoy themselves, they have to pull back. make us work harder. the it-skirt is two skirts, the it-dress is two dresses, the it-bag is actually two bags. and then all that's left is literally pieces. the cost of living, the cost of being alive, it all keeps rising. do you make do with your half or do you work harder to make a whole. you can't see it all but you think there's no way in hell that you are whole. at the same time, halves round up to wholes, there's no way you are left with less. i like these half pieces because they are already a halfway to a collage. i already wear different earrings because i've lost a half of all my pairs. there are three holes in my ears anyways, it will never be even. i think my life is in pieces right now, but not in the way that means it's broken. nothing was dropped and nothing shattered. suddenly all the things are new, everything in my life is different than 2 months ago, than 6 months ago, than a year ago. i am working twice as hard to make it whole because all the puzzle pieces are sky pieces or maybe ocean pieces and they always look like they match with each other but there's one way that is meant to work best. 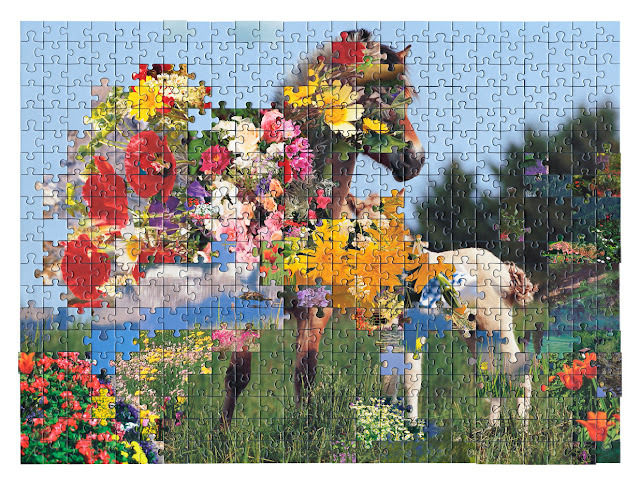 i can't tell if i want the picture to look perfect at the end or if i want it to be like a kent rogowski, an unfamiliar landscape of familiar pieces.